Jasmine tea is characterised by the naturally sweet tea flavour as well as the fragrance of jasmine flowers. Quality Jasmine teas are made by scenting tea leaves with fresh flower buds. Baked green tea is often the preferred base tea selected for jasmine tea scenting, though there are many very enjoyable black jasmine teas available. To enjoy the tea is to enjoy it's fragrance and the calming combination of tea and jasmine. Jasmine has been long associated with relaxation and is common in aromatherapy. In China, Jasmine teas and flower teas tend to be more popular among tea lovers in the north of China. It is said that the harder water is more suited to these types of teas. Jasmine tea is usually prepared by placing the leaf directly in to a covered porcelain cup or other kinds of cup/mug with a lid in order to keep its aroma. Most jasmine teas can be infused multiple times making them very convenient and cost effective. When enjoying jasmine tea, one can smell not only the fragrance of the tea liquor, but also the fragrance on the lid. Popular types of jasmine tea include green tea based Xiao Long Zhu 小龙珠 tea pearls or dragon pearls, which come in a range of grades of which the quality varies tremendously. Typically you can distinguish the grades when dry from the proportion of jasmine flower to green tea; the size of the pearl - small being a sign of quality; the colour of the green tea, with a paler, softer green being preferred. When preparing the jasmine tea you will notice higher grade teas will be a much paler and vibrant green often with fine hairs. As with all good teas the leave should consist of no more than two leaves and a bud, with limited amounts of stalk. Very popular are jasmine blooming teas otherwise known as blossoming teas, flowering tea, display tea or art tea amongst many other names. These intriguing hand made teas capture the imagination and with a multitude of different designs you never quite know what you might discover. 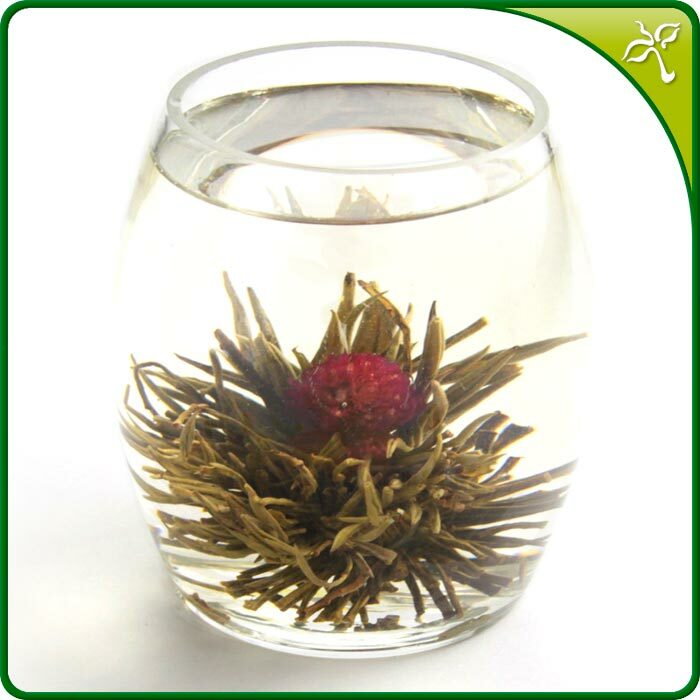 When preparing the blooming teas, it is best to find a tall glass that is heat resistant, ideally with a stem or a tall bodied glass teapot such as our Blooming tea glass teapot. Fill the glass with near boiling water and drop the tea in. We don't want spoil the surprise so we won't mention what happens! After 3-4 minutes, decant the tea liquor in a jug and serve, you can refill the glass with hot water to produce additional infusions that can be drunk whilst continuing to enjoy the show. These teas can usually be infused 3-4 times (or more) depending on personal preferences. Once you have finished drinking the tea, pour off all the hot water and then refill with cold water so you can enjoy the visual feast without the tea colouring the water. 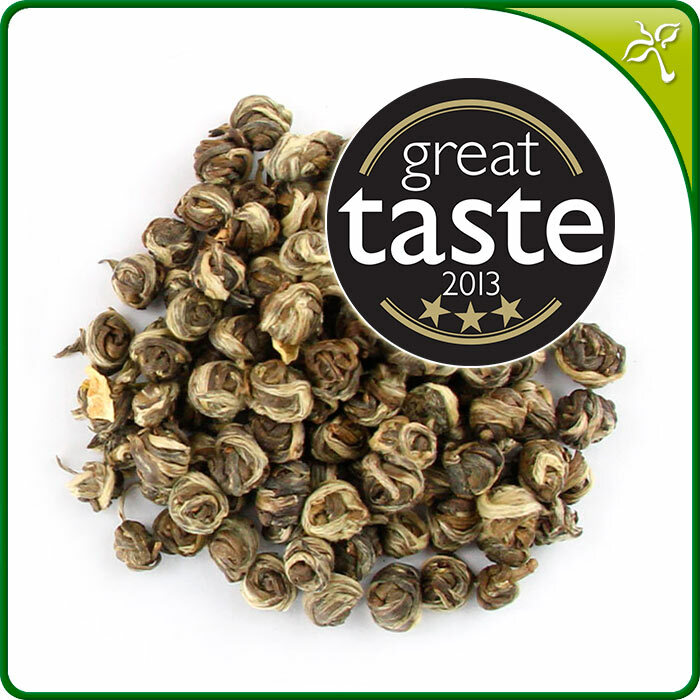 As most jasmine teas are blended with tea leaf i.e. Camellia sinensis they do contain caffeine. Due to the terroir nature i..e in the influence of soil, climate etc., of tea then it is very difficult to exactly say how much caffeine is each type of tea as it will vary season to season, year to year and tea farm to tea farm. If you are sensitive to caffeine it is best to avoid teas in the evening or to look at the many wonderful tisanes available. Looking for more information on how to select a superb Jasmine tea? Visit our tea article Refreshing Aromas of Fine Jasmine Teas.